Facility visitors sign into Echo by sending a short keyword to the Echo gateway. The gateway then associates the user with the local system. Once signed in, the user will receives updates on adverse weather conditions and other messages passed by the facility staff. Users of Echo include: marinas, sports complexes, schools, parks, industrial facilities and other outdoor venues. Many other services use questionable business tactics. At Storm Systems we follow the law and are completely FCC/TCPA compliant. Our number can support the largest venues and send messages to hundreds or thousands of people instantly. Each site can have administrator accounts that can create messages and alerts. 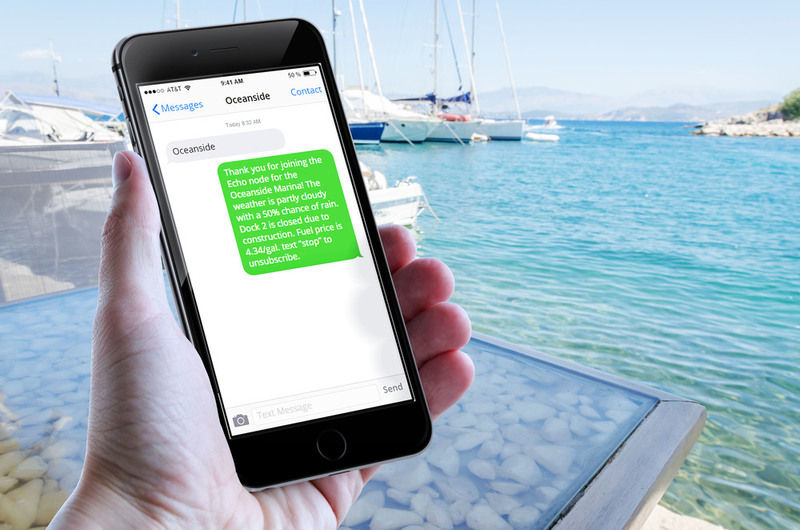 Easy to use and completely handled by SMS messages. Echo runs on our dedicated cloud server so you don't have to worry about the infrastructure. Site administrators can push out alerts and updates for instant notifications when needed. US based customer service always ready. Our custom GIS database scans the area for weather threats instantly notifying visitors. Our weather computation engine derives weather from a complex system of sensors and data sources.